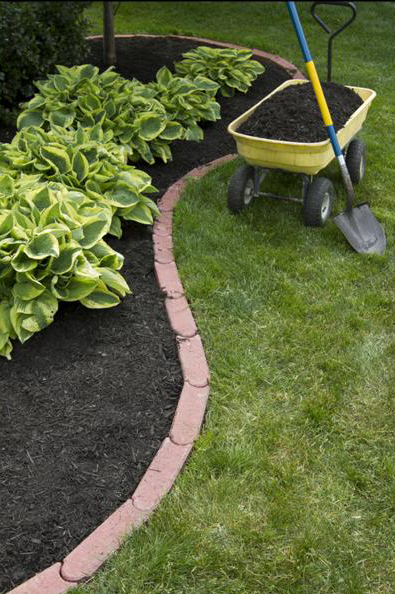 Mulching is a common practice for homeowners with a garden. It has many benefits, including reducing soil erosion, suppressing weeds and helping control soil temperature. It also helps the soil retain moisture and adds nutrients to the soil when it breaks down, so your plants get all the goodness they need. There are many different types of mulch, each providing its own unique benefits that may be best for certain projects, yards or times of year. Check out the different types of garden mulch below to see how you can incorporate them into your landscape. We're starting our list with something you might not typically think of as mulch. However, it has many of the same qualities. Gravel, pebbles or stones can be used to create walkways throughout your garden, control weed growth, provide good drainage to restrict soil erosion and keep the soil moist. Depending on the type of stone you use, they can also absorb and retain heat. If you're going to use stones on your borders and walkways, do your best to keep them contained. Stones that get into the yard can be picked up by your mower creating a safety concern and damaging your blades. These types of mulch are often naturally occurring in your lawn making it easy and affordable to incorporate them into your garden. Mulching leaves and clippings into small pieces is essential to create proper mulch that will break down over time rather than mat and damage you yard. This is a great type of garden mulch for both your flower beds and your grassy lawn as it naturally blends into the landscape and quickly breaks down. As they decompose, grass clippings and leaves release nitrogen into the soil while pine needles are more acidic and offer the perfect balance for optimal lawn health. You can either spread this mulch as you mow or work it into your compost to give your yard what it needs. Order mulching mower blades from Job-Rite Mower to make sure you have the tools you need to create this mulch that's essential to the health of your lawn. The definition of mulch is technically any ground cover. And whether you're trying to keep out weeds or kill the grass to start a garden, this type of mulch will keep moisture in and weeds out. Newsprint is the optimal weed barrier in flowerbeds as it lets water in and keeps weeds suppressed. Plus it can be covered by a more attractive mulch or compost for a natural look, and will break down over time. Landscaping fabric is available in plastic and biodegradable geotextiles. While it keeps the weeds out and warms the beds, it can also keep water out, and you'll need to cut slits for your plants. Finally, cardboard will kill weeds, but can also kill grass, which makes it a great natural way to kill the lawn where you want to start a vegetable garden or flower bed. The most common type of mulch, wood chips provide aesthetic and practical value. Wood chips keep soil warm and moist, can be used on top of other coverings like newspaper, and look great in your flower beds. You can find wood chips made from different materials and colored with vegetable dye as well as thinner bark shavings to find the perfect style for your garden. Plus, the large chunks of wood chips mean it lasts longer than other types of mulch. When you're mulching, it's not just about the type of mulch you use, it's also about how you use it and when. You should weed all the beds before mulching and lay about four inches of garden mulch to adequately keep out weeds. When you put it down, be sure to pull it slightly away from the base of plants to avoid rot. You also want to choose the right type of mulch for the location and season. As mentioned above, finer garden mulches like grass and leaves can be used in beds or the lawn, compost can be spread anywhere as long as it's fully decomposed, and wood chips are best left to beds. From a seasonal perspective, straw, leaves, pine needles or grass are winter mulches that will keep your beds warm during colder months, while wood chips should be added to beds mid-spring to keep bed temperatures moderate throughout the hot summer months. You'll also want to consider the breakdown of your different types of mulch, noting that wood chips will take longer and need to be replaced less often than grass, newsprint or compost. Learn more about garden mulch from your local home and garden store. As a final note, when maintaining your lawn and mowing around flower beds, you may want to consider using a string trimmer to avoid kicking garden mulch into the yard.